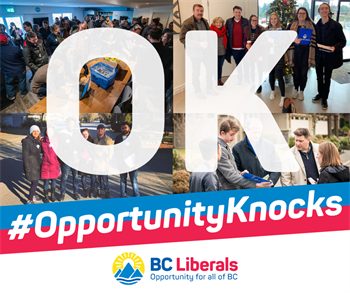 Last month, we started a new initiative called Opportunity Knocks in order to keep our momentum from the Nanaimo by-election going. After a very successful outing in Surrey-Guildford, Port Moody-Coquitlam is organizing a canvassing event. We need your help to make this happen and win back government from the NDP. Join us for an afternoon of door-knocking on Saturday, April 27 at 2:00 PM in Port Moody-Coquitlam – a riding the NDP won by less than 2,000 votes in the 2017 election. Our goal is to identify potential support in areas across British Columbia and start conversations with voters about the NDP's reckless taxes and destructive policies that are making life less affordable and less rewarding for Port Moody-Coquitlam residents and British Columbians. If you haven't door-knocked before, don't worry! We'll have experienced team members on hand to provide you with training and support. Please feel free to invite friends or family members to join us. Register today to let us know we can count on you for April 27!